Many people throughout Asia never have the opportunity to know they are loved by the Creator until a film team shows them Christ’s miracles, sacrifice and resurrection. Fifty-year-old Jagrav stood before the silent crowd. His words were clear, but none of his neighbors responded to his declaration. 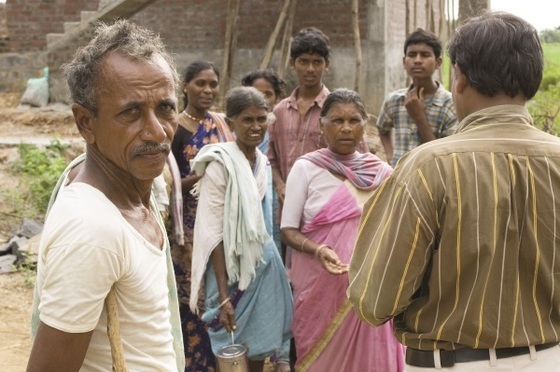 Jagrav walked over to the two GFA-supported workers and told them he wanted to know more about the Christ. Could Jesus be the answer he had been looking for all his life? Jagrav grew up as a devout follower of his ancestral religion, and he was familiar with all the proper rituals and practices he needed to perform. But despite his diligence, Jagrav could never find fullness of joy or true peace in his heart. Life continued on, decade after decade, but no answer came. Eventually he and his wife had three children, two girls and one boy, but their little ones didn’t bring the peace Jagrav longed for, either. It didn’t help that he and his wife continually fought over petty things. He didn’t know what to do. When a GFA-supported film team arrived in Jagrav’s village, most people didn’t want to hear what the two men had to say. The team members, Pranit and Kharanshu, prayed God would go before them, and soon several men and women, including Jagrav, said they were eager to watch a movie about the life of Jesus. As the projector displayed the love of Jesus on a portable screen, the crowd watched enthusiastically. When the film was over, the team showed another one called “New Life.” At the end of the night, many people exclaimed how amazing it was. However, despite their overall enthusiasm, most people didn’t want to change their lives in the light of this news—except Jagrav. He stood before the crowd and made a bold declaration; then he invited the GFA-supported workers to his home so he could learn more about Jesus. Something had stirred his heart: hints of peace and joy he had never known before. 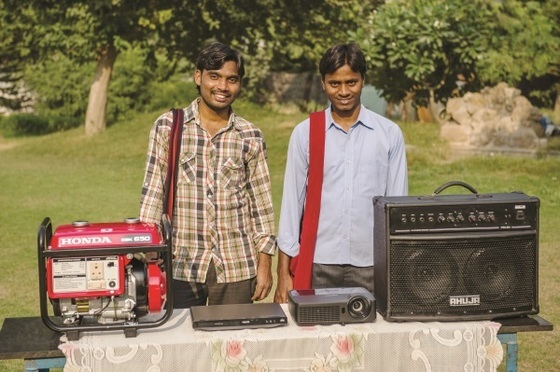 These are two GFA-supported missionaries standing by a generator, speaker, DVD player and LCD projector. Such equipment, provided through GFA friends like you, makes it possible for more people to hear and see the love of God displayed. Thank you! As Jagrav talked with Pranit and Kharanshu the next evening, he encountered the power of the Holy Spirit. God revealed how Jagrav could find lasting joy—and Jagrav leapt at the opportunity. He walked away from that evening a changed man. He took a copy of the New Testament, which he began reading every day. His wife didn’t try to stop him, but she made her disapproval clear. She told him how their relatives and the other villagers would look down on him for his decision. But Jagrav responded with an unexpected joyfulness to her disparaging remarks. Although his relatives have scolded him severely, even threatening to take away his wife and children, Jagrav is firmly in love with Jesus. Because there are no other Christians nearby, Jagrav travels to the neighboring village to worship Jesus in fellowship with other believers. Despite the challenges he now faces, the joy and peace Jagrav experiences far exceed any hardship, and he is delighted to know Jesus the way he does. Praise the Lord!